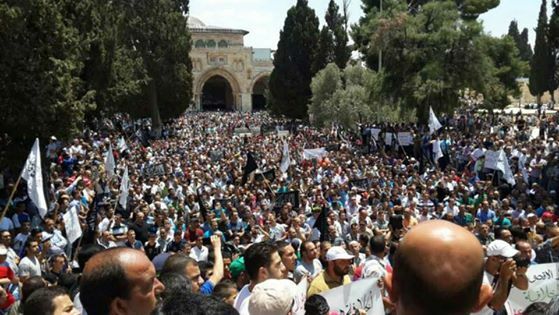 Hizb ut-Tahrir in Palestine has organized a huge rally in Masjid ul-Aqsa upon the occasion of the anniversary of the abolition of the Khilafah. It reminded the Ummah in general, and her armies in particular, of their duty to liberate Masjid ul-Aqsa and all of Palestine from the filth of the Jewish occupation. The warm call on behalf of Masjid ul-Aqsa, included a call to the largest and most powerful army of the Muslim World, the Pakistan Army. The call stated that, “Have not your souls longed for Al-Aqsa, have not your foreheads yearned to prostrate on the soils of Al-Aqsa, have not your hearts craved to meet Al-Aqsa? Have not you yearned for the station of Israa’ of RasulAllah (saw), have you not deliberated with yourselves to become martyrs on the soil of the blessed land for your blood to mix with the blood of the noble Companions? Al-Aqsa is calling out to you, where is Al-Farouq Omar, where is Salahuddin... Where is the Khilafah of the Muslims, do you belittle the fact that the station of Israa’ of RasulAllah (saw) is desecrated by the Jews and their filth? This is the call of Al-Aqsa to you on the anniversary of the destruction of the Khilafah, Establish the Khilafah and liberate me, establish the Khilafah and rescue me...”. All media outlets are requested to broadcast this video and fulfill their responsibility to let the people of Pakistan and their army knows what Masjid-e-Aqsa demands from them.